So it was my first ride of 2014 today. I’d been dying to get out on the bike, partly because of my new Garmin Edge 800 but also because I’d been planning a few rides and just hadn’t been able to shake off the flu I came down with on New Years Eve! Anyhow, I managed to get out today. The idea was to get out and just go for a ride. I’d been playing with Ride with GPS to see how route planning would work with the Garmin. I’d planned a route from Potters Bar to Letchworth Garden City, along National Cycle Route 12. This route was about 40Km and I thought it would be a good test of the Garmin and also the Talkytoaster OpenStreet maps, as I was using these as the basis of my routing as they’re free. Well I managed to get out in the morning before the weather got to bad so that was a plus. I decided that I wasn’t going to go quite as far as Letchworth - I wasn’t sure I would cope with there and back again today and due to engineering works, I couldn’t rely on support from National Rail! Anyhow, so I followed the course fairly well and deliberately went off course at one point early on as I wanted to initially cut straight down to the NCN 6 as soon as I left Potters Bar but I realised the road I would be going down has a flood warning normally so I avoided it and went a different way with the knowledge I could join up at a later point. Turns out this was probably wise considering the scenes I saw further on my ride! 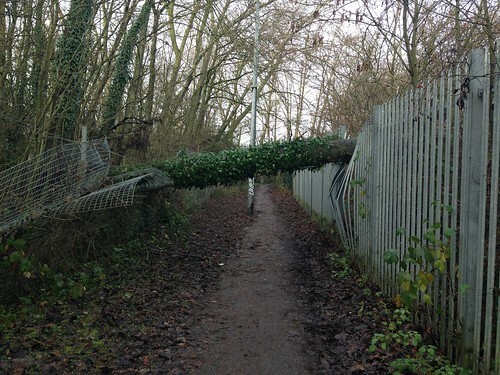 The first obstacle I came across was a fallen tree over the footpath just outside Welham Green. Had to dismount and duck under for this section. As I entered Hatfield along the path, the path runs alongside the river and the railway lines. Well, the river certainly looked like it had swollen. 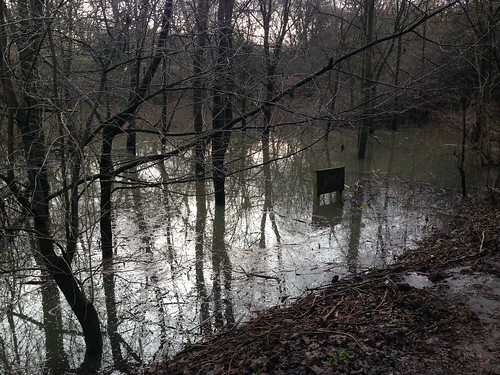 As can be seen in the two images above, the water had risen right up to the path. Thankfully it was clear and I carried on. The routing on the Garmin worked perfectly, though I might have a play with it as it did seem a little late giving directions (i.e. it would tell me where to turn when I was directly at the junction - not ideal if I’m at speed!). However, it worked fine other than that and got me to Welwyn, where I decided to head home via St Albans. This time I wasn’t so lucky with the water! Just outside St Albans, I had to go through a puddle that was up to the crankset of my bike. I ended up with wet feet but made it through intact. After that was fairly easy going. Must add that I went down the cycletrack/footpath down the side of the A414 and I have to say it isn’t the most fun road to cycle down but at least there is a cycle track there which makes it much safer to use. Means I can get across from St Alban’s easier and that’s a plus.